DSC is the Canadian brand name of choice for professional installers. 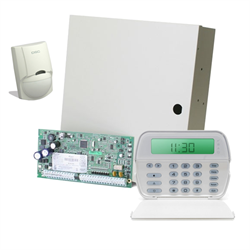 This DSC hybrid wired and wireless starter kit supports up to 8 wired zones/sensors and comes with a wired keypad with built-in wireless receiver, allowing expansion using wireless fobs or sensors. The keypad included in this kit is a foxed message keypad, which will show zone numbers. We recommend adding a PK5500ENG as a secondary keypad to allow for easier programming and zone naming. Or you can purchase KIT32RFK5500NH which includes the RFK5500ENG full message keypad. Additional wired zones can be added, 8 at a time to a maximum of 32 wired zones using the PC5108 zone expander(s). 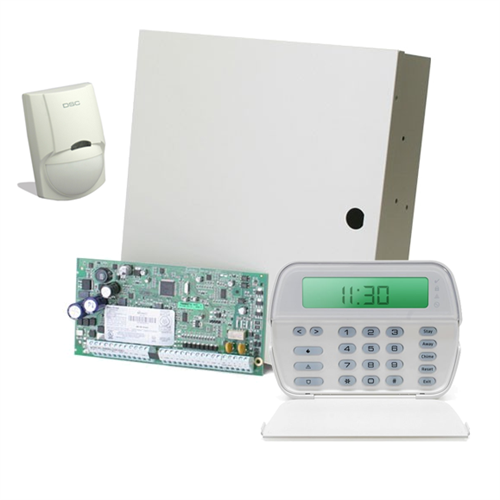 This alarm system can be professionally monitored or can be self monitored by reporting to a regular telephone or pager using a standard telephone line. NEW: Purchase an Envisalink EVL-4 add on internet module for smart phone control, email and SMS alerts with NO FEES. Note: Power supply, phone jack(RJ31X), battery not included, consider adding ALARM-HWKIT if needed.